There’s nothing like getting the most bang for your buck. 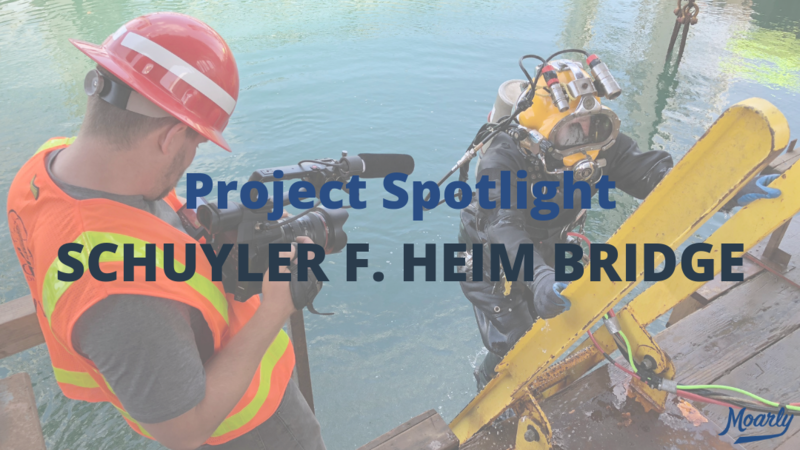 That’s exactly what happened when Global Diving & Salvage and Penhall Company both utilized our video production skills for the same project: demolition of Schuyler F. Heim Bridge in Long Beach, California. The demolition of Schuyler F. Heim Bridge actually started years ago, but crews stalled when they couldn’t get deep enough to remove the bridge’s concrete footings – footings that blocked construction of a replacement bridge. When conventional methods didn’t work, California Department of Transportation called on Global Diving & Salvage and Penhall Company. We flew to California to capture the work Global Diving & Salvage was doing as the main subcontractor on the project. Innovation is the name of the game at Global, so we highlighted their use of wire saws, core drilling, and overall marine construction – hoisting 80,000+ pound pieces of concrete out of the water with a crane. Penhall Company was also key to the success of the Schuyler F. Heim Bridge project. Their wire saws were integral in cutting up the concrete for removal and disposal. Thanks to the partnership between Penhall and Global, crews finished well ahead of the intended schedule. To help showcase the equipment and effort put in by Penhall Company, they also asked to team up with us on a project video. Using the same content we captured for Global Diving & Salvage, and scripting different soundbites, we were able to put together another solid story for Penhall as well. As a video production company you can’t ask for anything more. We partnered with two incredible companies to showoff the impressive work they do. The visuals of massive chunks of concrete coming out of the water, wire saws kicking up rooster tails, and divers doing complex work underwater was impressive too. For everyone involved, the Schuyler F. Heim Bridge project was a success. If you’re company is looking to highlight its work in Seattle or beyond, please feel free to contact us at Moarly Creative. You can also connect with us on Twitter, Facebook and Instagram. We’d love to hear from you!